Another day, another dollar; another month, another milestone. Listed propertyshares have definitely found their way up. The GPR 250 index for listed property gained no less than 6.7% in March 2010. 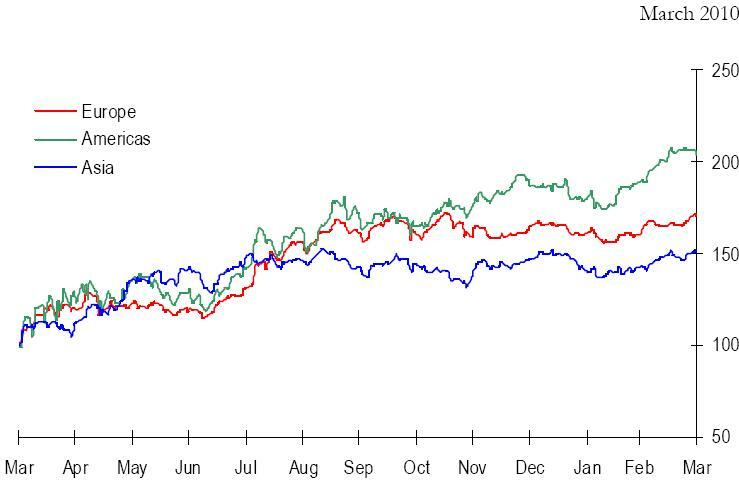 The index ended the first quarter of 2010 with a gain of 5.1%, again outperforming global equities (MSCI: 4.8% YTD). The GPR Global 250 index was predominantly driven by Africa and Americas (9.7% and 9.0% YTD respectively, in local currencies, against 3.6% for Europe and 2.7% for Asia). It should be noted however, that Europe recorded a 6.9% gain in March 2010 alone, vis-a-vis the global index at 6.7%. All previous updates on the GPR index may be found here. For more info, backgrounds and data on GPR and for your own copy of their monthly update, check their website. Next What do you think of @Property_Update on Twitter?